Belize City, Thursday, February 15th 2018: The Belize Tourism Board (BTB), in collaboration with tourism industry stakeholders, raised U.S. $59, 934.00 (Bz $119,868.00) as part of the Dollar for the Caribbean Relief Fund campaign. The fund was created to assist victims of Hurricanes Irma and Maria, which severely devastated many Caribbean countries in September last year. This morning Ms. Karen Pike, BTB’s Director of Marketing and Industry Relations, presented the cheque to Mr. Hugh Riley, Secretary General of the Caribbean Tourism Organization (CTO) during a virtual press conference hosted by CTO in Barbados. In his response, the Secretary General said, “we thank you Belize on behalf of the entire Caribbean family.” During the press conference, an overview on the state of the tourism industry in the Caribbean was also presented. As part of its Dollar for the Caribbean Relief Fund Campaign, each participating tourism stakeholder donated a $1 for every guest; the BTB then contributed by donating $1 for every tourist arrival for the month of October therefore, creating a multiplier effect. The BTB initiative was supported by the Belize Tourism Industry Association (BTIA), the Belize Hotel Association (BHA), Tropic Air, the Belize Airport Concession Company (BACC), Tour Operators, water taxis, and hoteliers amongst many others. During the first week of September, category 5 Hurricane Irma pummeled a number of Caribbean countries in the northern Leeward Islands and the northern Caribbean leaving a long trail of devastation. Many residents of these countries were left homeless, without food, power, water and basic essentials. Two weeks later, Hurricane Maria followed the same path further exacerbating the level of destruction throwing many of these countries in a severe state of despair. The Caribbean depends on tourism as their chief means of survival and the devastation by both hurricanes has stalled the economies of countries affected, which may take several months or perhaps years to recover. 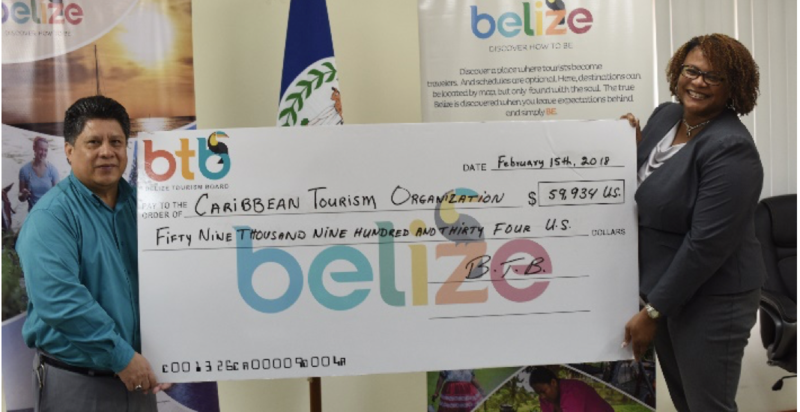 The BTB and the Belize tourism stakeholders are extremely pleased that they were able to make a contribution towards the Caribbean Relief Fund and take this opportunity to offer their heartfelt thanks to all Belizean stakeholders and organizations that donated generously in order to ease the road to recovery for our Caribbean sister countries. According to the CTO, approximately U.S. $135,000.00 was raised by the Caribbean Hurricane Relief Fund Campaign.